My Weekly Indicator post is up at XE.com. The recent trends all continued this past week. In several recent articles, Ed Morrissey of Hot Air has argued against the ACA in quite vociferous terms. Unfortunately, his articles not only misdiagnose the basic problems that led to passage of the ACA, but offer completely unworkable solutions. Before we get to ObamaCare, let’s recall the rationales for government imposing top-down control over one-sixth of the nation’s economy. First, we had to end the issue of the uninsured, which had spiked as a percentage of the population after the Great Recession, mainly from unemployment. 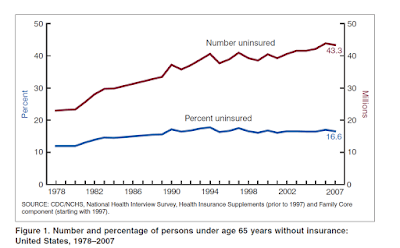 During 1968–1980, the percentage of persons under age 65 years who had private coverage remained stable at about 79%, while the number with private coverage increased from 140.5 million to 154.1 million persons (Tables 1 and 2). 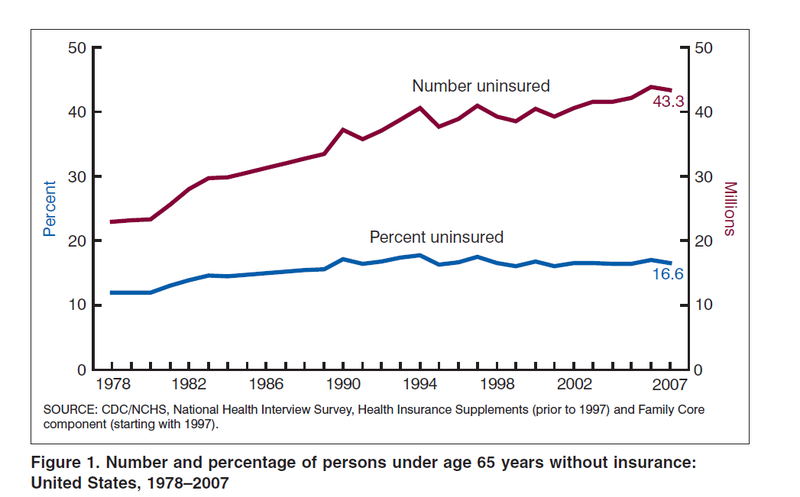 During 1980–2007, the percentage with private coverage declined steadily, except during 1996–1999. From 1999 to 2007, the percentage of persons under age 65 with any private coverage declined at an average rate of more than 1% per year, to 67% in 2007; the number of persons with private coverage remained at about 174 million during this period. The downward trend in private coverage was driven in large part by a decline in employer-sponsored coverage. In 2007, 62% of persons reported employer-sponsored coverage, down from 71% in 1980. In short, Ed, the uninsured was a growing problem for decades. Bankruptcies resulting from unpaid medical bills will affect nearly 2 million people this year—making health care the No. 1 cause of such filings, and outpacing bankruptcies due to credit-card bills or unpaid mortgages, according to new data. And even having health insurance doesn't buffer consumers against financial hardship. The findings are from NerdWallet Health, a division of the price-comparison website. It analyzed data from the U.S. Census, Centers for Disease Control, the federal court system and the Commonwealth Fund, a private foundation that promotes access, quality and efficiency in the health-care system. Even outside of bankruptcy, about 56 million adults—more than 20 percent of the population between the ages of 19 and 64—will still struggle with health-care-related bills this year, according to NerdWallet Health. And then there’s the fact that insurance companies continued to whittle down the risks they covered, largely by denying coverage to people with pre-existing conditions. So, the only people that were covered were those who really didn’t need it. The only option is to repeal it and introduce market-based reforms that eliminate price-signal opacity, especially in routine care. I love this option. For non-emergency care, consumers are going to start calling around to doctors to compare prices. Really Ed? Let me use a routine physical as an example. First of all, what is supposed to happen at a routine physical? What tests should be done? What types of analysis should occur? I honestly don’t know. And, neither do most people. This alone gives dishonest doctors and advantage: they can advertise the lowest price, do minimal work, and tell the consumer that, “you don’t need all that other stuff.” Unless the consumer also happens to be a doctor, he’ll most likely listen to the “learned professional” on this matter, pay little money and receive sub-standard service. And, what about the idea of having a doctor who actually knows you and your family history? Doesn’t that provide an asset to the patient that Ed’s system would completely obliterate? And just how will be learn about prices, Ed? Wouldn't an exchange (like what we currently have and that was originally proposed by Republicans in response to Hillarycare in the mid-1990s) be the best place to accomplish that? And then there’s the huge glaring problem of when most people access medical care: when they need it, and so are therefore at an extreme negotiating disadvantage. Let’s say you break your arm. Under Ed’s scenario, this might not be considered a catastrophe, and so would fall out of coverage. Are you going to call around to every doctor to get a price quote on that? Dear Ed: take it from someone who not only knows economics but also designs insurance programs for a living: you don't know what you're talking about. 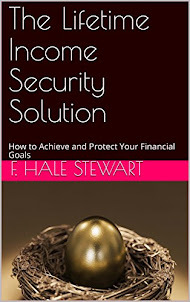 I have a new post up at XE.com. There are a number of signs that we are after the midpoint in the economic expansion for job growth. Over at Hot Air, Jazz Shaw assures us that Germany's demands are only fair, as they are a Greek creditor. In short, this isn't a coup, but instead parent simply taking control of a situation made worse by an errant child. But for an article that deals with a very complex international economic situation, his piece is completely devoid of any data. So, let's provide some context to point out how completely wrong his analysis is. To start, you might want to go to the website tradingeconomics.com, which has a ton of economic information on literally every country in the world. Let's start by looking at what the Greeks have already done, starting with government spending. By the way -- I'll use pictures to make it easier. The Greek economy had three straight years of contraction. Again -- THIS IS BAD. Both long-term and standard unemployment metrics are at depression levels. Again, THIS IS BAD. The purpose of austerity is to cut spending. This will make the bond vigilantes happy and also encourage consumer spending, thereby growing the economy, allowing it to increase at rate sufficient to lower the debt/gdp ratio. There's just one problem: as the chart above shows, it doesn't work as advertised. Not even close. In fact -- the EXACT OPPOSITE HAPPENS. And, ask yourself this question: how many creditors negotiating with a bankrupt debtor don't take some kind of haircut on their loans? Answer from the real world: quite literally, none. There is no reason to believe anyone at Hot Air has the background or capabilities to seriously discuss international or domestic economics. They embarrass themselves on a regular basis with their articles. But this latest piece is especially bad due to its complete omission of any data. And that is the real crime here: their readers think they're getting meaningful analysis. But, instead, they're getting noting of substance. An overwhelming majority of those who voted no– about 88 percent — believed that, as a result of an OXI vote, negotiations would continue, as you can see below. Only 5 percent believed that a no vote would mean Greece would exit the euro zone. By contrast, those who voted yes were much more worried about Grexit. In fact, 61 percent of them believed that would be the most likely outcome of a no vote. In other words, the 61% of Greeks who voted "no" a week ago thought they were going to get an end to austerity and to keep the Euro too (and a pony!). So, apparently, did Tsipras. Syriza never had any intention of actually exiting the Euro if they couldn't get an end to austerity. Since a credible threat, carried through, to leave the Euro was their only leverage, they have been crushed by the creditors. This entire episode, given Tsipras's apparent cluelessness, has been a failed turning point. Either there will be a move towards fiscal union on Germany's terms, or other southern European protest parties will understand that they must actually be prepared to leave the Euro. Addendum: I don't mean to be hard on the Greek people, who have suffered badly and will now suffer even more. But they tried to bluff, when other Europeans could read poll results too, and knew that the Greek people were not in favor or leaving the Euro. So the creditors called Greece's bluff, and Greece folded. It is easy for Americans to be armchair strategists from 4000 miles away, and think that surely, the Greeks must have a contingency plan for leaving the Euro. They didn't. I don't mean to be too hard on the creditor nations either. It wasn't just the German people who opposed a bailout. Imagine your cousin Joe, to whom you made a loan last month, comes to you. He says he can't pay it back, so he asks you for a writedown. But he also asks for a new loan. How accomodating would you be? Probably, if you considered a new loan at all, you would demand a security - something you could sell if Joe defaults on the new loan too. But again, the bottom line is, the Greek people had unrealistic expectations. They have been crushed, and now the creditor nations, like Germany, will use Greece as an example to insist that Europe follow their fiscal terms.